This year we felt that it was time for a Rivers Ride Reboot so we’re delighted to offer riders the fresh challenge of FOUR FANTASTIC NEW ROUTES which are suitable for riders of ALL ABILITIES – from families and occasional riders looking for a charity or personal challenge all the way through to seasoned sportive addicts looking to test their mettle against an epic new Lake District sportive route. The Jennings Rivers Ride has developed a reputation as Cumbria’s friendliest cycle sportive and we’d like to invite riders old and new to join the Rivers Ride Community on Sunday 2nd October for a ride to remember from our new start / finish venue in Cockermouth. We invite you to take this cycling challenge to help raise money for Cumbria Community Foundation – the charity behind the Flood Recovery Appeal which helps bring people who care together with causes that matter. The charity awards more than £2m a year in much needed grants to over 500 community projects per year. 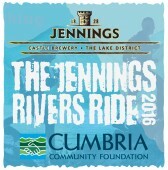 The Rivers Ride was established as a fundraising and community response to the 2009 Cumbria floods and from the very beginning the event has been supported by local brewers Jennings. As the Jennings Brewery in Cockermouth was, once again, hit by flooding in 2015 and we wanted to create fresh new challenge this year it seemed appropriate to move the event to Cockermouth. 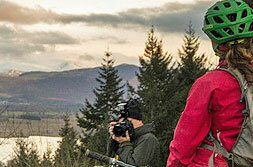 This year the Family Ride format is changing to a treasure hunt on wheels. This on and off road challenge is designed for mountain, hybrid and cyclocross bikes and will see families plan & navigate their own route around a cycling orienteering / Trail Quest course spurred on by the challenge of collecting treasure (chocolate coins). Whether you collect one coin or all of them every family who returns with a coin wrapper (we anticipate they’ll be empty at the end) and pops it into the draw is in with the chance of winning a prize. The Jennings Rivers Ride Short Route has always been a tough but do-able challenge for the not so regular rider and this year’s new route is no exception. You may be glad to hear that Whinlatter Pass has gone but it’s been replaced by, no less challenging, rolling roads with the odd cheeky climb (or two). A shade over 80km / 50 miles on some of the finest roads and lanes the North Lakes has to offer. Don’t let the absence of the big name passes kid you into thinking this is just a normal 50 mile ride – with over 1,600m of ascent and a route profile that’s either heading up or down – this is a beautiful ride and is one to savour. An epic new Lake District sportive route that offers the same climbing challenge of a big day in the Alps or Pyrenees. The signature triple pass challenge of The Big Day Out – Whinlatter, Newlands & Honister – remains but are now at the start of the route. After that the climbs get a little shorter and lower but they more make up for that with their quantity! A real saw tooth route profile and one that offers views of some of the best scenery in the Lake District.